Earlier last week, Chinese property company Pangu holdings abruptly canceled their sponsorship of Transformers: Age of Extinction. Pangu holdings, which owns and operates the Pangu 7 Star Hotel in Beijing, now wants to have its image removed from the movie. 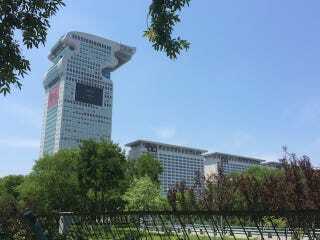 The Pangu hotel is huge. Chinese and Western outlets such as Variety have reported on the situation. Effectively, Pangu feels that its partnership with Paramount pictures and its associates isn't all that it's cracked up to be. Pangu holdings now wants to have its logos and images removed from marketing and distribution materials. This is where things get odd. Marketing and distribution materials equate to everything from posters to the film itself. Pangu wants Paramount to remove Pangu and its images from the movie. In a statement quoted from the Variety article, Pangu writes "When marketing and distributing 'Transformers: Age of Extinction,' (the studio) is not allowed to use our company's image, logo, our building's inside and outside views and its recognizable elements." The statement continues, "If already used in the film, they shall all be deleted." Now here's the thing. According to pre-release information, Transformers 4 has about 30 minutes of footage that takes place in China. While most of the footage is supposed to feature Guangzhou and Hong Kong, there are parts that take place in Beijing, particularly Olympic Park, where the Pangu building is. In that area the only things that stand out are the Beijing National Stadium (The Birds Nest), the National Aquatics Center (the water cube) and the Pangu Building. Paramount has also said that Pangu Plaza has a prominent placement within the film. Which is interesting because Pangu Plaza is very... bland. Unless the shots of Transformers in Beijing are facing away from the Pangu, it'll be hard for an editor to remove the whole building from the background while Optimus Prime lays the smackdown on some Decepticons. At the same time that Pangu is trying to get its images removed from the movie, the hotel seems to be using Transformers as a marketing gimmick. As of noon today, there is a statue of Bumblebee standing in front of the hotel entrance. Staff at the hotel claim that the statue's been up for a while and that passersby often stop by for a photo-op. Seems kind of two-faced to me. Then again, I've never been to a seven star hotel. Five star yes, seven... not yet. Transformers: Age of Extinction will be in theaters in Beijing on June 27. Update: The Wall Street Journal is reporting that the dispute between Pangu Holdings and Paramount is being resolved. It appears to have been a misunderstanding with contracts involving two other Chinese parties.